Will my auto be the same after the accident as it was before? Yes, your auto will be the same after the collision. A1 Mississauga Auto has the latest in auto body repair equipment and trained personnel to complete the repairs to factory specifications. Will the paint on repairs match the factory finish? Matching your vehicles colour is critical at A-1 Mississauga Auto. We utilize the most advance tools available today. With RapidMatch you will receive the best colour match available within seconds. To ensure a perfect finish we use materials from PPG paint products in all finishes. We offer a written, transferable warranty on all collision repairs and refinishing jobs for the life of the vehicle. What about handling insurance claims? A1 Mississauga Auto Collision has an excellent reputation handling claims for the insurance industry. Due to customer satisfaction, we are proud to have "preferred shop" status with major insurance companies. We will work with you and your insurance company to resolve out your claim. We will contact the adjuster or appraiser, coordinate billing, and help make arrangements for a rental car, if needed. Why Should I bring my vehicle to A1 Mississauga Auto Collision? we utilize the most advance tools available today -with RapidMatch you will receive the best colour match available within seconds. Do you just do autobody repairs? No, we have a fully equipped auto repair facility, featuring the latest in 4 wheel alignment, using laser technology. 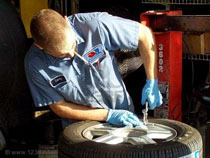 After your vehicle is repaired on the outside, keep us in mind for all your mechanical maintenance and repairs. We have licensed mechanics on duty at all times. Trust all your vehicle repairs, inside and outside to us.